La Sardane returns after winning the Intercontinental (G3). 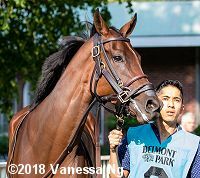 The Belmont Stakes Racing Festival runs from Thursday to Saturday, highlighted by the 150th Belmont Stakes run on Saturday, the third leg of the Triple Crown series. Conditions were excellent for the 3 stakes races on Thursday afternoon, with partly cloudy skies and temperatures in the mid 60's. 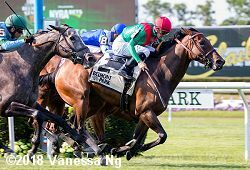 The highlight on Thursday was the $200,000 Intercontinental Stakes (G3) for older fillies and mares sprinting 7 furlongs on the Widener turf. 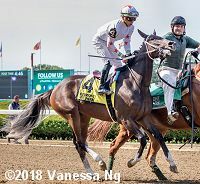 South Beach winner Stormy Victoria was sent off as the 5-2 favorite in the field of 8 off a 5th place finish in the Honey Fox (G3) before finishing second in the License Fee. In to challenge her included 7-2 second choice Delectation, fifth in the Turf Sprint (G3) at Churchill Downs, and 9-2 third choice La Sardane, winner of the Prix de Sandringham (G2) at Chantilly last year and an allowance winner at Churchill last out. 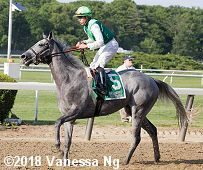 Jockey Luis Saez sent 9-1 Faypien to the lead through fractions of 22.87 and 45.43 while pressed by 19-1 Heavenly Score and stalked by 6-1 Malibu Stacy. Entering the stretch, jockey Flavien Prat, 4th early aboard La Sardane, came out 4 wide for room and took over at the 1/8 pole through 3/4 in 1:08.16. The pair dueled the rest of the way with La Sardane prevailing by a neck in 1:20.04 over the firm going. It was a nose back to Heavenly Score third, while favorite Stormy Victoria checked in 7th. Left: La Sardane in the winner's circle. Winning trainer Neil Drysdale said, "She's coming along well now. She had a long time off, but Team Valor just said take your time with her, so we gave her plenty of time off. 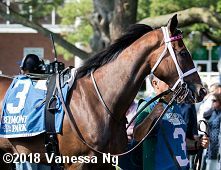 The first race back, things didn't go quite according to plan, but in the next race (a win on May 3 at Churchill Downs) we could see what she was. We cut her back in distance just to teach her and settle her. I think it's working out well so far." Right: La Sardane in the paddock. Winning jockey Flavien Prat said, "She was cutting back in distance today, and she came in for this very sharp. The first time I rode her she was really fresh, but since that time she's developed very well. In her last race she was sharp and she really showed her ability today." Left: Second place finisher Faypien in the post parade. The Bob Baffert trainee improved her record to 4 wins, 3 seconds, and 1 third in 10 starts, earning $432,775 for owner Baoma Corporation. Right: Third place finisher Heavenly Score in the paddock. 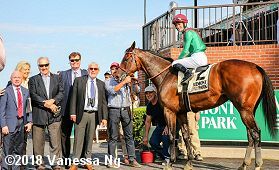 The John Terranova trainee improved her record to 4 wins, 2 seconds, and 2 thirds in 13 starts, earning $255,150 for owner Curragh Stables. Seventh place finisher and beaten favorite Stormy Victoria returns after the race. 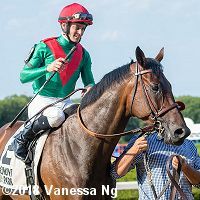 The Christophe Clement trainee has a record of 6 wins, 5 seconds, and 3 thirds in 25 starts, earning $459,749 for owners Tango Uniform Racing and The Elkstone Group LLC. 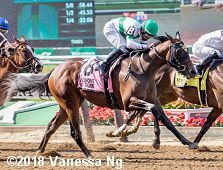 The $200,000 Wonder Again Stakes (G3) featured a field of 9 three-year-old fillies going 1 1/8 miles on the inner turf course. 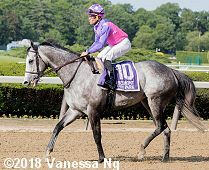 Significant Form was sent off as the 4-5 favorite off her win in the Memories of Silver after finishing 4th in the Breeders' Cup Juvenile Fillies Turf (G1). 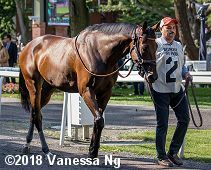 In to challenge her included 9-2 second choice Daddy is a Legend, 3rd in the Edgewood (G3), and 6-1 third choice La Signare, 2nd in an allowance at Keeneland after breaking her maiden at Toulouse, France. 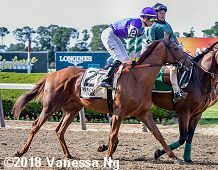 Jockey Joel Rosario sent La Signare to the lead first time by and she set easy fractions of 26.36, 50.95, and 1:14.54 while as many as 3 1/2 lengths ahead of Significant Form second and Daddy is a Legend third. Entering the lane, La Signare continued to lead through 1 mile in 1:36.17 with Significant Form cutting her lead down to 1/2 a length. However in the final furlong La Signare pulled away to win by 1 length in 1:48.84. It was a neck back to 7-1 Mighty Scarlett third. Left: La Signare heads to the winner's circle. 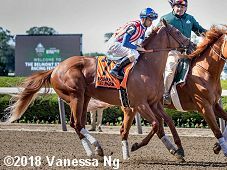 Winning trainer Brian Lynch said, "I didn't really think there was a lot of speed in the race, so it was going to be a bit of a cat and mouse game. I'm always a big believer that pace makes the race, so we put her where she was comfortable and evidently that's where she was comfortable. She had been doing so well coming into the race, so it didn't surprise me that that's where she ended up." Right: La Signare in the the paddock. Winning jockey Joel Rosario said, "This one had some speed, that's for sure. She ran very good. She ran nice early, and ran very good after that. She relaxed very nicely and�had a long slow gallop early, and before turning for home, I said, 'well it's great, because�I know we were going slow,' and she handled it really well. Good run. I like her. It's always good when they run like that." Left: Second place finisher and beaten favorite Significant Form returns after the race. 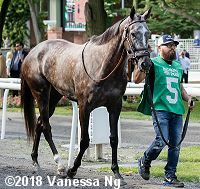 The Chad Brown trainee improved her record to 2 wins, 1 second, and 0 thirds in 5 starts, earning $270,415 for owner Stephanie Seymour Brant. Right: Third place finisher Mighty Scarlett in the post parade. 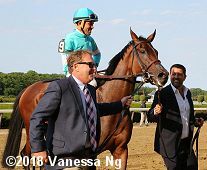 The Chad Brown trainee improved her record to 1 win, 1 second, and 1 third in 3 starts, earning $69,400 for owners T. Coleman, M. Doheny, Head of Plains Partners LLC, and Long Lake Stable LLC. 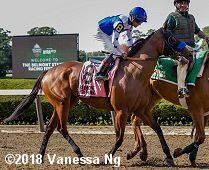 Kicking off the 2018 Belmont Stakes Festival stakes action was the $150,000 Astoria Stakes for 2-year-old fillies sprinting 5 1/2 furlongs on the main track. 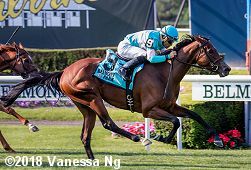 Tijori was the even-money favorite in the field of 6 off her debut win at Santa Anita, over 3-1 Eyeinthesky, a debut winner at Churchill Downs, and 7-2 Wonder Stone, a debut winner at Keeneland. Jockey John Velazquez sent Wonder Stone to the lead through fractions of 22.06 and 45.53 while pressed by Tijori and 6-1 Lady Apple. At the top of the lane, Lady Apple moved up to gain a short lead through 5f in 58.44, but 11-1 Athens Queen, 4th early under Albin Jimenez, circled the field 5 wide to get up to win by a neck in 1:05.37 over the fast main track. It was 1/2 a length back to Eyeinthesky third, and 3/4 more to favorite Tijori fourth. Left: Athens Queen in the winner's circle. 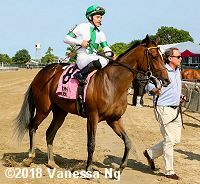 �Winning trainer Wesley Ward said, "She was always a nice filly from day one, we started breezing her over at Turfway in March, and she showed a lot of talent. She wasn't at this level like she was today so it looks like she's getting better." Right: Athens Queen returns after the race. 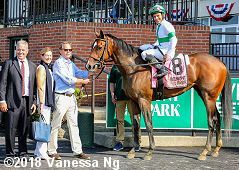 Winning jockey Albin Jimenez said, "She was always a nice filly from day one, we started breezing her over at Turfway in March, an "She's learning a lot and she surprised me in the end when she kept going and got away. My plan was to break and go, but it didn't work that way. But she seemed comfortable being behind. She looked great and kept going. One of my dreams was to win a big race here, and I did it. I know the history of this place, so absolutely, it's special." Left: Second place finisher Lady Apple in the post parade. Trainer Steve Asmussen said, "She's a very nice filly. Obviously pleased to have the opportunity to train her and I think she's going to be very nice in the future." Right: Third place finisher Eyeinthesky in the paddock before the race. The Mark Casse trainee improved her record to 1 win and 1 third in 2 starts, earning $39,480 for owner Gary Barber. Fourth place finisher and beaten favorite Tijori in the post parade. The Simon Callaghan trainee has a record of 1 win in 2 starts, earning $39,900 for owner Kaleem Shah Inc.